Who Needs a Health Advocate? This calendar features events from WASHAA, WASHAA Members, local nonprofit organizations, and the local community. 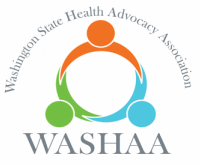 It hosts a myriad of different events focusing on health and health advocacy, including programs designed for patients, caregivers, family members, and healthcare professionals. ​You can also Click Here to learn the latest details about WASHAA's upcoming events! Would You Like to Add an Event to Our Calendar? Are you a WASHAA Member? If you are a nonprofit, we would be happy to host your events on our site for free. Please contact Jessica with the details regarding your event. Not currently a WASHAA member? Sign up today and enjoy the benefits of having your community events listed on our website! Never miss another event! Sign up for our monthly eNewsletter to receive upcoming news and event announcements. For information about all of WASHAA's past events, Click Here. © 2008-2017 WASHAA. All Rights Reserved.